Fall fashion has such rich colors that mirror nature. 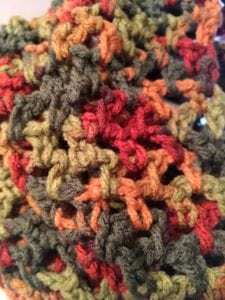 This crochet pattern works up quickly using just one skein of yarn. 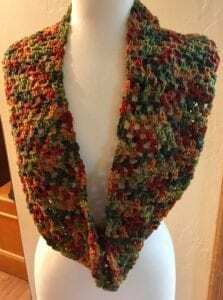 While this infinity cowl can be made with any color of yarn, this one just looks beautiful in these gorgeous fall colors. 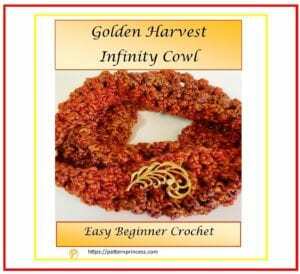 Within the last few years, there has been a surge in infinity cowls for fall and winter fashion. It seems that they are for sale in stores everywhere lately. Create your own style and make a unique scarf just the way you like it. Here is a close up of the cowl to help see the stitches. Chain 30 and continue onto row 1. Row 1: in 4th ST from hook, *DC, CH 1 skipping a ST, DC in next St*. Repeat from * until the last ST ending with a DC. Row 2: Turn, CH 4, insert hook into the previous row CH 1 space (not the stitch itself, the space between the two DC from the previous row), YO draw through the yarn and complete a DC. *CH 1 insert hook into previous row CH 1 SP, YO draw through the yearn and complete a DC*. Repeat from * until the last ST ending with a DC. Rows 3 and on: continue to repeat row 2 until desired length. This one is 65 inches in length. 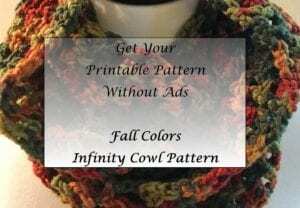 Enjoy wearing or gifting your infinity cowl. 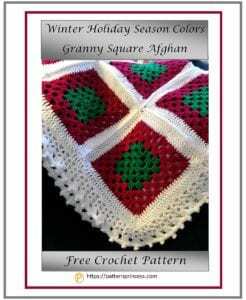 You may also be interested in these crochet patterns.